Treat your eyes in amazing 4K gaming action with the PS4 Pro Console and God of War. Boasting more than double the graphics processing power of the old-school PS4, you can now get full value out of your 4K TV and join the gaming revolution as everything comes to life in amazing detail and vivid colours with the PS4 Pro. Experience higher quality visuals, as well as faster and more stable frame rates. Cutting edge hi-res graphics combine with the latest High Dynamic Range (HDR) technology to ensure visuals are now more realistic, strikingly vivid and truer to what the human eye sees in the real world, creating an absorbing gaming experience suitable for all ages. God of War finds Kratos on a deep and reflective journey of growth, violence and the desire to become a better man for the sake of his son, Atreus. In a world of monsters, dragons and gods, the weight of responsibility rests heavy on your shoulders – and when your life is filled with blood and chaos, how can you stop the mistakes of the past in order to protect your future? The new Pro's other exciting features include Blu-ray movies, internet access, digital photo and video storage, plus video chat, so you'll never be short of fun. There's no need to worry about your multiplayer experiences because you can still connect, collaborate and compete with friends using original PS4 consoles and the new PS4 Slim using the PlayStation Network. You will be all ready for the launch of PlayStation VR too, bringing to life an immersive 360° gaming experience that is not to be missed! You can use the drop-down menu above to pick the bundle that suits you best, including with an extra new look DualShock 4 wireless controller and/or 12 months PlayStation Network access. Very interesting. How are Very for ordering electricals as just straight up purchases? Never used before. Not such a great deal anymore as God of War can be had for around £25, but still amongst the best either way. Very is ok been using them for many years, have not had any issues with them. Ok to spread the over 12 months to pay it all off. I know very is not for everyone but I have bought plenty from very and had no issues. The majority of the pro deals I seen over the past 2 - 3 days had been sold out. I have been keeping an eye on the stockinformer website. The majority of the pro deals I seen over the past 2 - 3 days had been …The majority of the pro deals I seen over the past 2 - 3 days had been sold out.I have been keeping an eye on the stockinformer website. What is going on with the lack of stock about on Pros at the moment? Will the 20% off code for new signups work with this item anyone know? What deal? Isnt this just rrp? Theoretically you're right it is just RRP, but theoretically you're wrong, because it has a game with it. I was hoping for a reduction during their days of summer deals like in the US where they are knocking $50 off as I want to buy a second pro. But with the lack of stock around I'll doubt they will reduce it over this side of the pond. Thanks for thr reply but I very much doubt this has got anything to do with the PS5. I mean yeah if it was out in a couple of months then I would imagine they would be ramping down production. But seeing as it's anywhere between 1 & 3 years away till its released unless Sony shock everyone at E3. 10% off only for electricals. Very interesting. How are Very for ordering electricals as just straight …Very interesting. How are Very for ordering electricals as just straight up purchases? Never used before. Never had an issue with Very and they are also good on returns. Every retailer is fine when you haven't had an issue with them. It's how they resolve issues that matters and Very are terrible at that. Everyone has been snapping up the ones with the hackable firmware. Not such a great deal anymore as God of War can be had for around £25, but …Not such a great deal anymore as God of War can be had for around £25, but still amongst the best either way. Voting cold simply because I got the limited GOW pro edition for the same price rrp. That wasn’t a deal and was a limited edition so this definitely isn’t one. Holy gods that's the worst trustpilot page I've ever seen. Regret even giving them my details for an account now, very glad I didn't place an order though. Hold on for imminent price reduction on the Pro.. I don't know about imminent, but it's common insider game industry knowledge that when Sony brings out the PS5, the game plan is to discontinue the standard PS4 and reposition the Pro as the entry machine with a price drop to or near the current ps4's £249 price. Same price available from Amazon with a choice of GoW, Detroit: Become Human, Horizon Zero Dawn or Shadow of the Colossus. 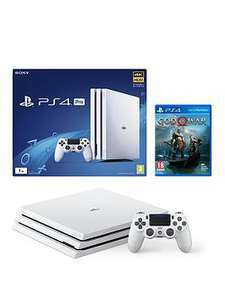 I don't know about imminent, but it's common insider game industry …I don't know about imminent, but it's common insider game industry knowledge that when Sony brings out the PS5, the game plan is to discontinue the standard PS4 and reposition the Pro as the entry machine with a price drop to or near the current ps4's £249 price. Was informed by the guy in Game the other day that they have been running down the stock ahead of E3. They have had maybe one in stock at a time max for over a month and unable to secure more. Based on that he advised me not to buy one on Saturday, they had one in stock in black (I know, a Game branch turning away a sale!) and so I am holding off a week or two if there is a Pro "Slim" or Pro V2 of some kind. I am also hoping for a revamped Pro version or at least a price reduction at the retailers on the PS4 Pro following E3! fingers crossed! if not, then I'll had to bide my time find one in stock and buy it at the current price I guess. I am also hoping for a revamped Pro version or at least a price reduction …I am also hoping for a revamped Pro version or at least a price reduction at the retailers on the PS4 Pro following E3! fingers crossed! if not, then I'll had to bide my time find one in stock and buy it at the current price I guess. Well their is is a temporary price reduction in America to celebrate this days of summer theme. It would seem very strange to hold back stock before a price reduction. Surely it would be the other way round. Was informed by the guy in Game the other day that they have been running …Was informed by the guy in Game the other day that they have been running down the stock ahead of E3. They have had maybe one in stock at a time max for over a month and unable to secure more. Based on that he advised me not to buy one on Saturday, they had one in stock in black (I know, a Game branch turning away a sale!) and so I am holding off a week or two if there is a Pro "Slim" or Pro V2 of some kind. I really can't see a slim or v2 being announced as there has been zero rumours online. And we know how nothing is kept secret anymore it's always leaked. Definitely worth waiting till after E3 though as there could well be a price drop. Been desperate to get a PS4 for a few months and been looking at deals daily to see what comes up. Surely there needs to be a price reduction soon? Not sure this is a deal, i paid the same more than a year ago with HZD.